"The Every-Other-Day Diet is the perfect diet for me." It's science-tested, science-proven. Dr. Varady has conducted many scientific studies on the Every-Other-Day Diet, involving hundreds of people, with consistently positive results published in top medical journals such as the American Journal of Clinical Nutrition and Obesity. Unlike most other diets, the Every-Other-Day Diet is proven to work. It's remarkably simple-and effective. On Diet Day, you limit calories. On Feast Day, you eat anything you want and as much as you want. You alternate Diet Day and Feast Day. And you lose weight, steadily and reliably. There's no constant deprivation. The Every-Other-Day Diet doesn't involve day after day of dietary deprivation--because you can still indulge every-other day. It's easy to keep the weight off. With other diets, you lose weight only to regain it, the frustrating fate of most dieters. But The Every-Other-Day Diet includes the Every-Other-Day Success Plan--an approach to weight maintenance proven to work in a study sponsored by the National Institutes of Health. 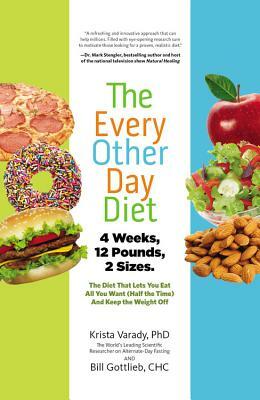 This book offers all of the research, strategies, tips, and tools you need to believe in the Every-Other-Day Diet and easily implement it in your life. It also includes more than 80 quick and delicious recipes for Diet Day, as well as a list of tasty prepared foods that make meals as easy as 1-2-3. The Every-Other-Day Diet is perfect for anyone who wants to shed pounds and feel great, without hunger and defeat. Krista Varady, PhD, is an associate professor of nutrition at the University of Illinois and the world's leading researcher into alternate-day fasting. She has published more than 30 papers on the topic in prestigious journals such as The American Journal of Nutrition and Obesity, and she has discussed her breakthrough findings with consumer magazines, such as Elle and Men's Health.